In today’s economy generating new and sustainable ideas to differentiate your customer experience are resulting an imperative to move beyond the buying cycle to developing new business models to meet customer’s needs. However old ways of driving innovation are not up to the task of meeting these new demands, requiring new ways of thinking. This imperative is being driven by a shift we’ve been hearing about for a few years now. That we’re moving (or perhaps have moved) from a Knowledge Economy to a Creative Economy. This Creative Economy is about great value being put on the ability to generate new ideas, not just in product development but in services offered and the experience delivered. This transition is happening as a result of knowledge commoditization (much of the left-brain work associated with knowledge is being shipped off) and product commoditization (price and quality is less of a differentiator). As a result companies are forced in to new ways of thinking about growth and that growth is coming from their ability to generate new ideas in these areas. Organizations are allowing power to move from the sources of capital to the sources of ideas. “Despite spending huge sums on research and development, most (US, European and Japanese) corporations had dismally low levels of innovation productivity. The article continued by saying, “the brutal truth was that up to 96% of all new projects fail to meet the targets for return on investment” (Nussbaum, Berner, & Brady, 2005, p. 72). Increasingly a new core competency for organizations is person-centered innovation along with a culture that embraces creativity and imagination. This new form of innovation is driven from a deep understanding of the consumer needs, by going beyond demographic trends and customer data, to truly walking in the customer’s shoes. The process is often referred to as Design Thinking; it is a creative process that is grounded in the needs of the target audience, encourages out of the box thinking and rapid iteration of ideas. As a designer, it is an approach that I have used throughout my career. I am excited to see the shift in thinking in organizations to one that has typically only seen in design houses. The goal of this kind of innovation is to create meaningful consumer experiences, not just the new or improved products but new service models, and in doing so create brand new categories or overall experiences. This article from Business Week is a must read. “The new (innovation) gurus focus more on micro-innovation — teaching companies how to connect with their customers’ emotions, linking research and development labs to consumer needs, recalibrating employee incentives to emphasize creativity, constructing maps showing opportunities for innovation. 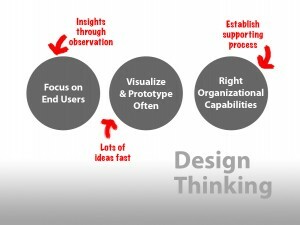 What was once only embraced by the Disney’s and Apple’s of this world, Design Thinking, has gotten the attention of the business community and is being taught in business schools. Stanford has a d-School which is run by the co-founder of IDEO. It’s an exciting time to be a designer.